Also known as the Mid-Autumn Festival or the Mooncake Festival, the Chinese Moon Festival is a favorite holiday for ethnic Chinese and Vietnamese people around the world. Perhaps second only to the Lunar New Year in popularity, participants observing the Chinese Moon Festival share fun, often-overpriced cakes (mooncakes) with people they appreciate. Some are tasty; some are as dense as hockey pucks and get filled with exotic ingredients. The Chinese Moon Festival is also a joyous time for family, friends, and couples to reunite under a full moon during harvest (September or October). All take a little time to appreciate the beautiful full moon on what is hopefully the clearest night of the year. The round shape and completeness of the full moon symbolize reunited pieces. The Chinese Moon Festival is a time to take a needed break from work; many people have a day or two off and celebrate through the weekend. Family and friends converge to give thanks and pay homage to the full moon, sometimes with poems. Mooncakes are gifted, swapped, and shared. Just as holidays get commercialized in the West, the mooncakes go on sale weeks in advance of the festival. Each year they become more elaborate and push the limits for ingredients, presentation, and cost. Businesses often give cases of mooncakes to show appreciation to clients and employees. Commercialization aside, the festival is a good excuse for couples to enjoy romantic time sitting under the full harvest moon. Many people choose to celebrate quietly at home among family. Travelers can enjoy the fun in parks and public spaces, but keep in mind that many shops and businesses may be closed in observance of the public holiday. Transportation will be busy. Public parks are lit with special displays and lanterns; there may be stages with cultural shows and parades. Dragon and lion dances — there is a difference! — are popular during the festival. 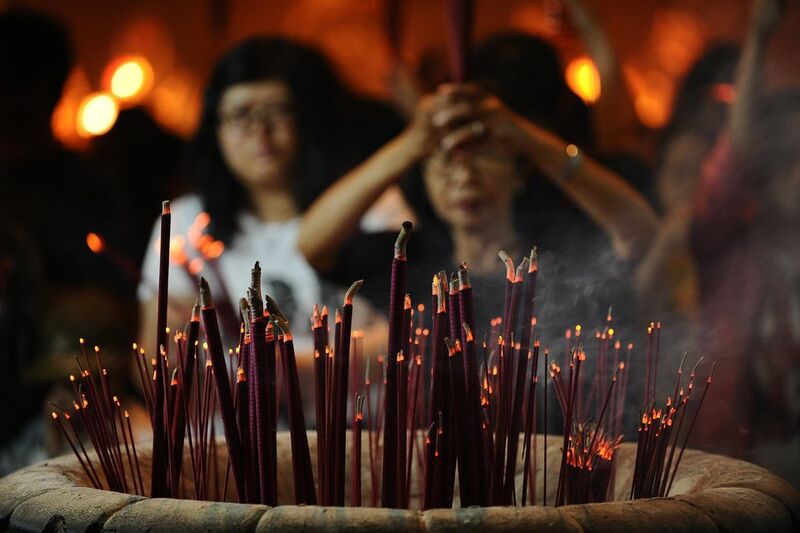 Incense is burned in temples to honor ancestors and the moon goddess, Chang'e. Bright lanterns are hung high from poles while floating, candle-powered lanterns get launched into the sky. Along with consuming mooncakes, hairy crab is a delicacy available around festival time. The Jade Rabbit, a creature from folklore who lives on the moon, is a popular symbol during the Chinese Moon Festival. To honor tradition, some people still make offerings to the moon, although this practice is becoming less common. The Chinese Moon Festival is designated as a public holiday throughout all regions in China including Macau, Hong Kong, and Taiwan. Expect all banks and some businesses to be closed at least one day. Public transportation will be busier than usual. The day is also a public holiday in Sri Lanka, as are all full-moon days. What's all the hype? Chinese mooncakes are round, baked, palmsize cakes eaten and gifted during the Chinese Moon Festival — or anytime a rich delicacy is in order. They're a popular gift, often given in decorative boxes to clients, family members, and important people. Mooncakes are made with egg yolks and come with a variety of fillings; the most popular are made from bean paste, lotus seeds, fruits, and sometimes even meat. The cakes are typically round to symbolize the full moon, although some are square. Many are skillfully decorated. Writing or patterns on top tell of good fortunes to come. Regional variations abound. The boxes for mooncakes are often as beautiful as the cakes inside, making them an attractive gift. Many mooncakes are sweet but not all. Some are savory. Artisans push the shock factor with new creations each year. Fillings such as sambal, durian, salted duck eggs, and gold flakes up intrigue and the price for a box. Despite the small size, Chinese mooncakes are often prepared with lard or shortening and are quite "heavy." Unless self punishment is a goal, you wouldn't want to eat more than one in a sitting. Many people choose to cut mooncakes into wedges or quarters to share them with friends over tea. Given the difficulty of making artisan mooncakes and the far-flung fillings involved, some are surprisingly expensive! Fillings that made a big splash in the past include unexpected options such as chicken floss, foie gras, ice cream, coffee, and others. One pricey mooncake variant contains shark fin — an unsustainable option. Around 11,000 sharks die per hour (roughly three per second), mostly due to finning practices driven by demand in Asia. The environmental impact is certainly not worth the made-up health benefits — shark fin contains concentrated levels of mercury! Some mooncakes share the same legacy as fruitcakes in the U.S. at Christmas: they get swapped and appreciated but don't end up consumed. You probably won't have any trouble finding mooncakes on sale weeks before the actual festival begins. Mooncakes will be available in every shop and restaurant. Hotels will have their own in-house creations on display. Even fast food and ice cream chains get in on the action during the festival. If you plan to give mooncakes that are wrapped or boxed, keep in mind that gift-giving etiquette differs in Asia from the West. Don't expect the recipient to immediately tear into a gift in front of you. Known as the Zhongqiu Jie (Middle Autumn Festival) in Mandarin, the Chinese Moon Festival dates back to over 3,000 years. As with all practices so old, a lot of legends developed over the years; it becomes difficult to understand the original traditions. Most stories are based on the idea that the goddess Chang'e lives on the moon; however, tales of how she got there diverge widely. One story suggests that the moon goddess was the wife of a legendary archer who was ordered to shoot down all but one of the suns in the sky. That's why we only have one sun. After accomplishing the task, he was given an immortality pill as a reward. His wife found and took the pill instead, then later flew to the moon where she lives now. Another Chinese Moon Festival legend states that paper messages inside of mooncakes were used as a way to organize the exact date of a coup against the ruling Mongols during the Yuan Dynasty. The Mongols were overthrown on the night of the Moon Festival. Although this legend seems a little more plausible than a goddess living on the moon, little historical evidence suggests that this is how the Mongols were defeated. Great news: You do not have to be in China to enjoy the Chinese Moon Festival! Chinatowns around the world will celebrate. China, Taiwan, Hong Kong, and Macau have the largest celebrations. But the festival is especially popular in places around Southeast Asia with large ethnic Chinese populations such as Vietnam, Singapore, and Malaysia. When Is the Chinese Moon Festival? The Chinese Moon / Mid-Autumn Festival starts on the 15th day of the eighth month as determined by the Chinese lunisolar calendar. The festival is most often in September, but occasionally ends up in early October. Dates for the Chinese Moon Festival change annually, but it's always celebrated in the fall.